Chia is one of Vivapura 's Seven Superb Superfoods. Certainly a noteworthy food that really gives you a powerful boost! It is considered by many to be Nature 's perfect food! Our Chia Seeds are wild-crafted from Bolivia. Traditionally Chia Seeds have been used by Native cultures of the South Western US and Mexico to increase stamina and endurance. Today, modern science has revealed Chia 's significant nutrients and profound healing properties. No wonder the Chia Pet gained such popularity in the 1980s. People are simply drawn to the tiny black Chia Seed. Optimal balance of Essential Fatty Acid (EFAs): Chia is the best source of omega 3 and omega 6 Essential Fatty Acids " provides the optimum 3:1 ratio. 30% of the Chia Seed's oil is Omega 3 oil. 40% of its oil is Omega 6 oil. 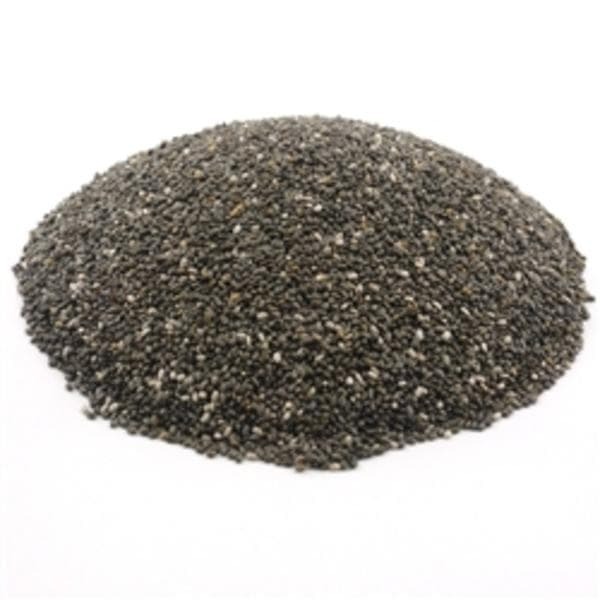 Chia contains the highest-known percentage of Omega 3 alpha-linolenic acid, an incredible 62% "64%. Chia 's balanced EFAs significantly boost brain power and brighten mood (EFAs are known for their antidepressive effects). Essential fats make cell membranes more flexible, and enable more efficient membrane function, including better nerve transmission and nutrient transport into cells. A healthy nervous system supports more efficient brain function. Easily Digestible: The shells are easily broken down, even when swallowed whole. There is no need to grind the seed in order to process them through the digestive tract (unlike flax seeds). This makes them easy to travel with and to eat early in the morning without waking up your household. Hydrating for the Body: Chia is highly hydrophilic, meaning it absorbs large amounts of water " about 10 times their weight. As such they are a great enhancer in hydrating our bodies. The water we drink is absorbed by the seed holding it in out system longer. You stay hydrated longer, and retain electrolytes in your bodily fluids. Great for athletes. Stabilizes Blood Sugar: Another great food for diabetics. Chia Seeds slow down how fast our bodies convert carbohydrate calories into simple sugars. When mixed with water or stomach juices, the seeds form a gel that creates a physical barrier between the carbohydrates and the digestive enzymes that break them down. The carbohydrates thereby are digested and converted into glucose (blood sugar) at a slow, uniform rate. There is no insulin surge or spike needed to lower the blood sugar level. This creates steady, stable blood glucose levels, also yielding steady, high energy levels. Regenerating: After eating, the nutrients travel to the cells very quickly due to the ease in digestion and assimilation. Use them when you want to build or regenerate healthy body tissue. Weight Control: Chia will help you lose excess weight, for two reasons. The first is that they are so filling that you will eat less of other foods. The second reason is that they actually bulk up and cleanse your body of old "junk" in your intestines. An excellent addition to a detox program. Nutrient Dense: The nutritional value per volume is astounding. A little goes a long way and keeps on giving. Protein - Chia Contains 20% or more protein. This helps reduce cravings and offers cardio-protective properties.FiberMagnesiumCalciumEssential Fatty Acids, especially ALA, a type of Omega 3 fatty acidAntioxidants (unlike flax) Mild tasting: Chia offer a mild nutty flavor and a pleasant crunch (when eaten dry) and creates a thickening hydrating gel when soaked or added to liquids. They won 't disturb the flavor of your dish and they will offer you a huge nutritional gift. Use as a nutrient-dense thickener in smoothies.Add to homemade salad dressing.Use in dehydrated cookies, breads, and energy bars or in baked goods.Thickener & Egg Substitute: Use ground or whole chia as a binder for your favorite recipes. 3 T=1 egg. Soak in water for 5 minutes. Add to recipe. Or substitute equal amounts Chia for flax seeds.Raw Porridge: Hand mix 1 part whole or ground Chia Seeds with 4 parts water or nut mylk. Allow 5 minutes for Chia to fully absorb liquid. Add a sweetener and any other desired ingredients. Best kept refrigerated for longer shelf life.